How to switch puppies to solid food. “Without a good intestinal flora there is no good health” is a slogan that according to our experience is gaining more and more importance. We encounter an increasing number of diarrhea and other intestinal problems (and not only in puppies) as a result of sparsely developed intestinal flora. We speak of a sparsely developed intestinal flora when there are not enough different colonies of bacteria present. In this case the food is not digested properly; it starts to rot leading to fermentation in the large intestine. Due to this diarrhea occurs and the dog is caught in a vicious circle and it is difficult to get it out without a natural approach. Good health starts with good intestinal flora. As a first requirement for good health it is important that in an early stage of life a stable intestinal flora is developed. Concerning this, 3 facts are of additional importance! Puppies are born without any form of intestinal flora. During the puppy phase the intestinal flora has to be developed through the intake of good-natured bacteria via the colostrum. All kinds of dry food (also Farm Food HE) are per definition sterile and therefore do not develop intestinal flora. With the above mentioned facts as a starting point, we already give the standard advice that, next to the supply with nutrients, the feeding of puppies must enable the development of a stable intestinal flora. 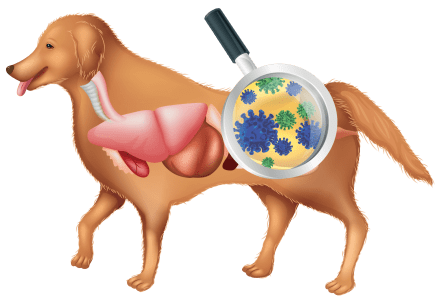 For the development and maintenance of a good and stable intestinal flora it is very important that the dog gets particular good bacteria from the outside through its digestion. The exposure to these bacteria does not have to take place with the daily feeding. It is our experience that dogs are also sufficiently stabilizing their intestinal flora when being exposed to dung from plant eaters (rabbit dung, sheep dung etc.). But because not all dogs and especially not all puppies have access to the above, we always give the standard advice to supplement feedings of puppies until the age of 6 weeks only with complete fresh meat. In the meantime, more and more breeders follow our advice and keep applying it. From experience it is known that a combination of fresh meat based on beef and tripe, such as Farm Food Fresh Tripe & Heart Complete is leading to the best result. Always have fresh drinking water available to the puppy. From an age of 3 to 4 weeks you start with supplementary feeding of the puppies, divided into at least 5 feedings a day. Start with Farm Food Fresh Beef Complete to let the puppies adjust to the useful bacteria. Gradually reduce the amount of milk and increase the amount of fresh meat. From about 5 weeks onwards, you can mix Farm Food Fresh Beef Complete with a bit of Farm Food Fresh Tripe & Heart Complete. For the mixing we have, next to containers of 400 gram, convenient little sausages of 110 gram each available. Continue with the amount of feedings per day but reduce the amount of milk each time. Between 6 and 8 weeks you can slowly switch to the Farm Food HE dry dog food. During these two weeks the Farm Food Fresh Tripe & Heart Complete is slowly reduced and you feed an increasing amount of Farm Food HE (still spread over at least 5 feedings per day). The quality of the bowel movement determines the relation between the fresh meat and Farm Food HE. Observe your puppies well and feed them accordingly. The only fact to keep in mind is the following relation: 50 gram Farm Food Fresh equals 25 gram Farm Food HE. From 8 weeks until approximately 8 months you replace Farm Food HE with Farm Food Fresh Tripe & Heart Complete fresh meat food for 2 days per week. 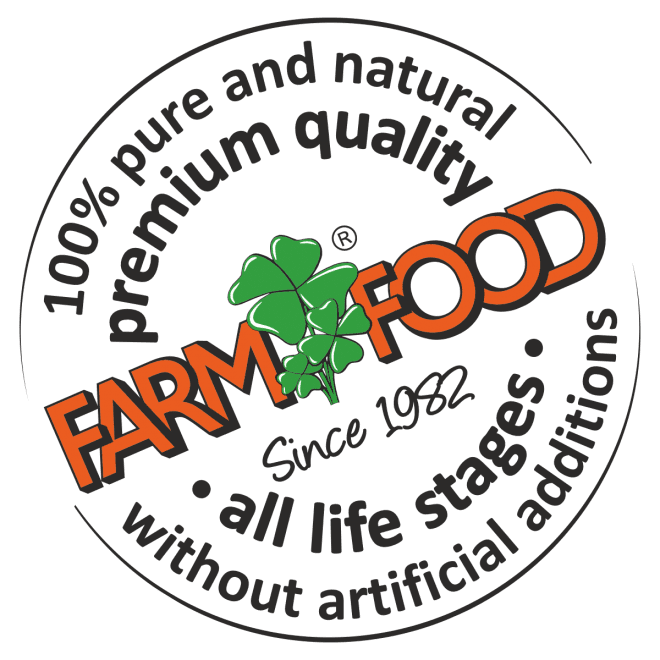 Because Farm Food HE is a compressed dry food (and as well as our fresh meat based on beef meat) you can mix Farm Food Fresh with Farm Food HE without any problem. The same relation is applicable, 50 gram Farm Food Fresh equals 25 gram Farm Food HE. Afterwards you can feed Farm Food Fresh Tripe & Heart Complete at least 1 day per week, until your dog is grown up (until an age of 18 to 24 months). For the maintenance of the intestinal flora, we additionally advice to allow your grown-up dogs a weekly fresh meat day (Farm Food Fresh Tripe & Heart Complete). This ‘fresh meat day’ is like a maintenance for the intestinal flora and you could also feed Farm Food Fresh more often to your dog.